Nissan to take over New York in 2013 | What Car? New York's iconic yellow cabs are to be replaced by a Nissan model. Nissan has beaten Ford in a battle to supply the city with a new generation of yellow cabs. 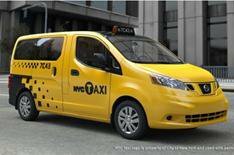 The Nissan NV200 was selected by the New York City Taxi and Limousine Commission to exclusively supply the city with its 13,000 taxis from 2013. It will carry more than 600,000 passengers a day and features roof panels to provide views of the city, independent air-conditioning, a charging station with USB plugs for the passenger compartment, with space for four and their luggage. Sliding side doors are designed to provide easier access, while a 'low-annoyance' horn is linked to flashing lights to reduce noise pollution. Power for the NV200 taxis, which will cumulatively cover 500 million miles a year, comes from a 2.0-litre four-cylinder petrol engine. Nissan is also supplying up to six taxi drivers with electric Leafs for them to try out in 2012.